Supreme Court Upholds University Of Texas' Affirmative Action Program : The Two-Way In a 4-3 decision, the court ruled that the university's "race-conscious admissions program" is constitutional. 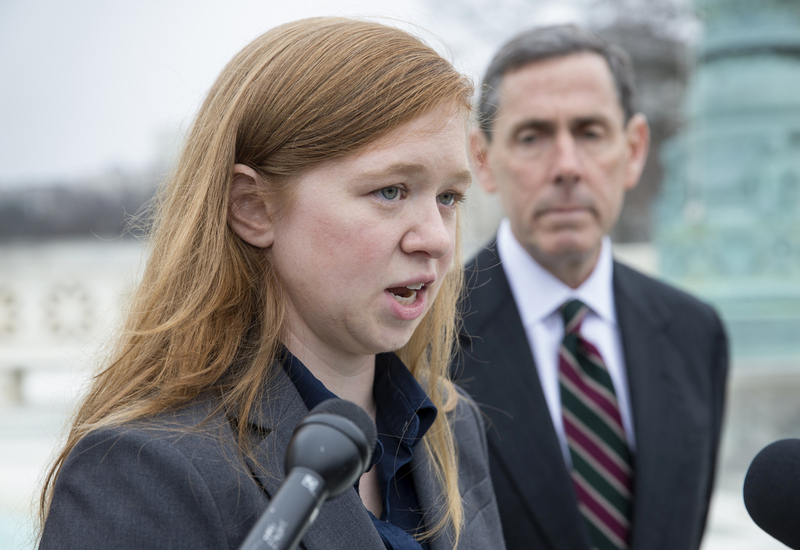 Abigail Fisher, who challenged the use of race in college admissions, speaks to reporters outside the Supreme Court on Dec. 9, 2015. The Supreme Court upheld the University of Texas' affirmative action program in a 4-3 decision. For the second time, Abigail Noel Fisher, who didn't get into UT in 2008, was challenging the policy in front of the high court. Fisher, who is white, argued that she had been the victim of discrimination because of her race. She argued that students of color with the same credentials were accepted into the school, while she was denied admission. The first time around, the 5th U.S. Circuit Court of Appeals upheld the constitutionality of the program, but the Supreme Court sent the case back with new instructions to give the case a tougher scrutiny. The appeals court reconsidered and came to the same conclusion: UT's program was constitutional. Fisher appealed once again to the Supreme Court. It's worth noting that UT's admission policy is complex: Most of its in-state students are admitted based on a policy of guaranteed admission to the top students of every high school. The rest are admitted using a combination of factors that include academic achievement and race and ethnicity. That part of the admissions process is what was being challenged in court. Justice Anthony Kennedy, who wrote the majority opinion, said universities should be afforded wide latitude in achieving intangible "qualities which are incapable of objective measurement but which make for greatness." Diversity is one of those qualities, Kennedy wrote, and so the University of Texas should be allowed to serve as a kind of laboratory to experiment with these kinds of policies. "Still, it remains an enduring challenge to our Nation's education system to reconcile the pursuit of diversity with the constitutional promise of equal treatment and dignity," he wrote. With that in mind, Kennedy noted, the University of Texas should continually reassess its admissions program. As might be expected, Justice Clarence Thomas wrote a one-page dissenting opinion that borrowed heavily from previous opinions. Thomas argued that race-conscious admissions are not permitted at all by the Constitution. "The Constitution abhors classifications based on race because every time the government places citizens on racial registers and makes race relevant to the provision of burdens or benefits, it demeans us all," Thomas wrote quoting a previous opinion. Justice Samuel Alito wrote a 51-page dissent saying the majority had gotten this decision "remarkably wrong." Alito argues that based on strict scrutiny, UT has to prove "why the discrimination is needed or how the discriminatory plan is well crafted to serve its objectives." All UT did, he argues, is use "unsupported and noxious racial assumptions" to defend its position.